Golden Boy Promotions CEO Oscar De La Hoya believes that a future all-Mexican showdown between Canelo Alvarez and Jaime Munguia is certainly possible somewhere down the line. This past Saturday night, Munguia badly struggled to win a twelve round majority decision over Dennis Hogan to retain the WBO junior middleweight title. There were many at ringside that saw Munguia losing the fight by as many as three rounds, and the Mexican boxer admittedly told reporters that he believed the contest would end up as a draw. One judge had it a draw at 114-114, and two others sided with Munguia with scores of 115-113 and 115-112. 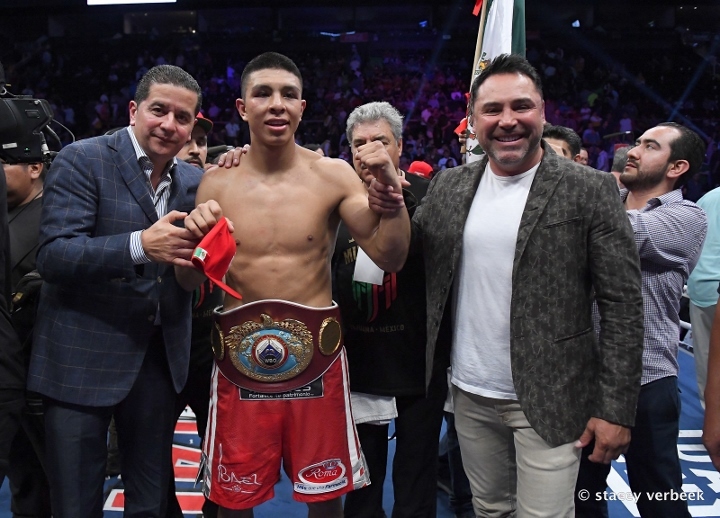 Munguia also stated that he was tired during the contest, possibly from the strain of getting down in weight to 154-pounds. The Mexican banger, according to his team, was going to make another defense before a move up in weight to 160-pounds. Based on his recent performance, a move to 160 could be coming sooner than later. Canelo is back in the ring on May 4th, in an IBF, WBC, WBA middleweight unification against Daniel Jacobs. De La Hoya cautions that Munguia would likely have to secure a world title, at middleweight, to secure Canelo. According to the WBO rules, if Munguia moves up – as the 154 champion he would become the mandatory to the WBO’s middleweight champion, who at the moment is Demetrius Andrade. “The truth is that he is very ambitious and I like that about Munguía. He wants to fight with the best in the world. And when you are the best in the world like Canelo, and if you are a champion like Munguía, a fight like that has to be fought in the future,” said De la Hoya to ESPN Deportes.